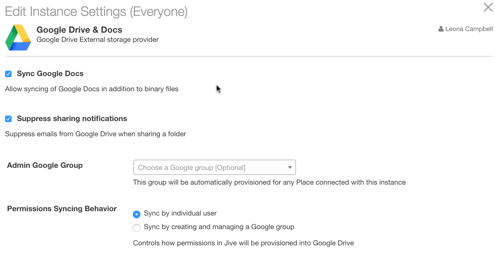 Setting up Google Drive as an external storage provider for the community allows users to select it as the external storage provider in Jive places. Before you can complete this step, you need to set up a Google Integration user account in Jive as mentioned in Setting Up Jive for Google Docs and need to install the Google Docs add-on as described in Managing Google Drive add-on in More Integrations Guide. In the user interface, go to Your avatar > Add-ons. Click Installed and make sure you see the StreamOnce and Google Drive add-ons in the list. Click Storage Management > Add Integration. Select Google Drive as the provider type. In Display Name, type the name you want community users to see when they select a storage provider for their place. In the list of Google Drive accounts already connected to your Jive community, select the integration account user, and it authenticates automatically. If you don't see the integration account user listed, click Add Another Account > Authenticate, enter the integration user account credentials, or select the integration user account from the list. Note that you can't use an account that is already connected to a different Jive community. After authenticating, you can see the fields as displayed below. Click Save to save your instance settings. By choosing one of the following options, determine which users can create places that connect to G Suite. For more on permissions, see Understanding permissions. All community users can create places that use this Google Drive connection for storage. Select the Enabled check box. Specific users or user groups can create places that use this Google Drive connection for storage. Start typing the name of a Jive permission group in the Permissions Override box, or click Select Groups and pick the group from the list. These groups are granted permission to create Jive places that can be linked to this storage instance. Under User Mapping Options, select the profile field to use for mapping users between Google Drive and Jive. We recommend that you choose the Jive profile field that contains the user email address you want to use for the Google Docs & Drive integration. Click Save to save the integration. You can see it listed in the Storage Management tab. In the Storage Management tab, clear the Allow users to choose Jive as internal storage check box if you want to remove the option to store uploaded documents in Jive for all newly created places. Use the Select default storage provider box to specify a default storage provider value for new places. This field defaults to Jive.